Web Push Notification marketplace add-on for Magento2 will allow sellers and the admin to send push notification messages directly to the web browser. The biggest advantage of using push notification is its ability to deliver notification immediately to the subscribed users. 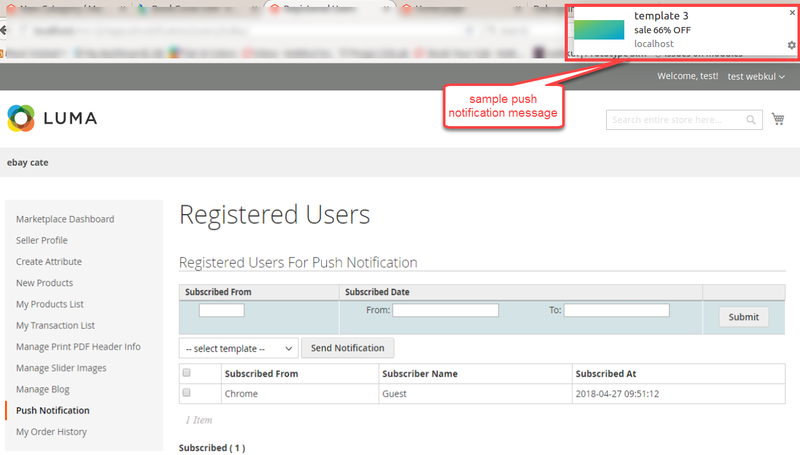 Unlike emails that sometimes fail to deliver or go to the spam folder, web push notification’s prompt and assured content delivery feature ensures that the notifications are for sure delivered to the users. As long as the browser is running, a subscribed user will get a pop-up message even without opening your website. This improves the user interaction and retention. Please Note – This is a marketplace add-on, in order to use this module you need to have Magento2 Marketplace Multi-Vendor module installed. Compatible with Mozilla firefox and Google chrome desktop browsers. 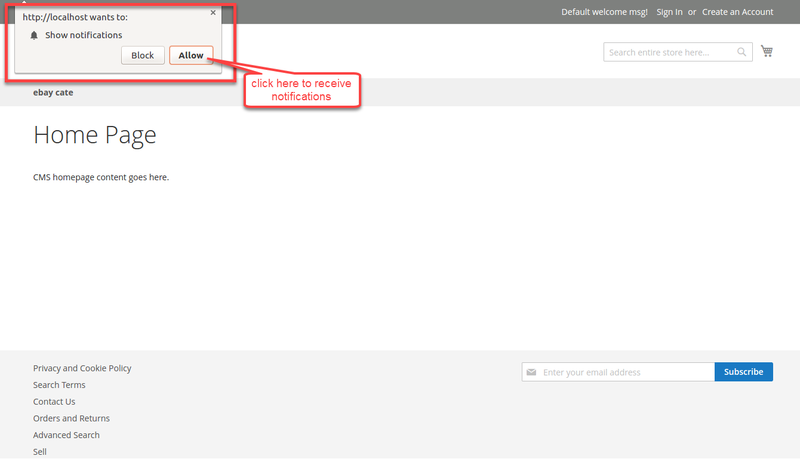 Notifications can be sent either to all or selected subscribed users. Download the zip file and extract its content on your computer. The extracted folder will have a folder named src, inside this folder, you will find app folder. Copy this app folder into Magento2 root directory on the server as shown below. 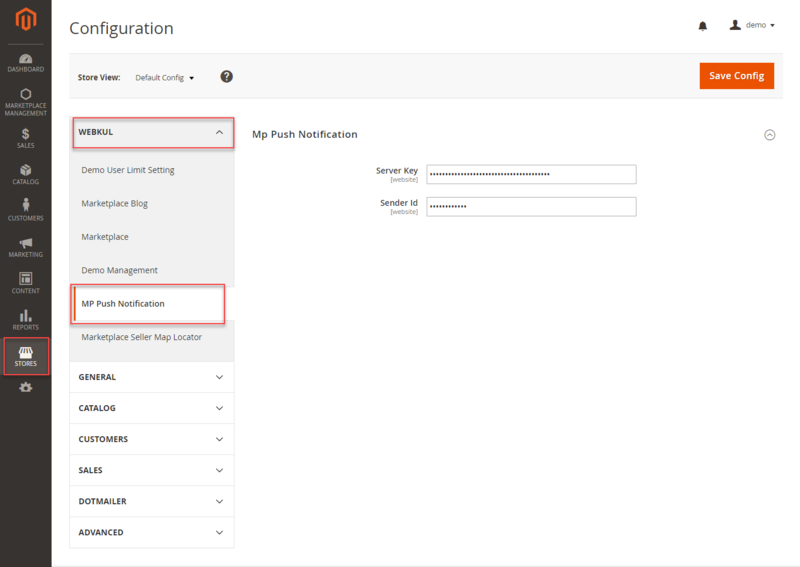 After running these commands, you need to flush the cache from the Magento admin panel by navigating through – System > Cache management as shown below. After flushing the Cache storage you will get a confirmation message as shown below. If you need to do the module translation, please navigate to the following path in your system app/code/Webkul/MpPushNotification/i18n. Open the file named en_US.CSV for editing as shown in the below screenshot. Once you have opened the file for editing. Replace the words after the†comma(,)†on the right with your translated words. In order to use this module, the admin needs to have Firebase Project Credentials, which will be used in the Magento2 configuration. Please visit this website https://console.firebase.google.com and create a new project with the Gmail account. 1. 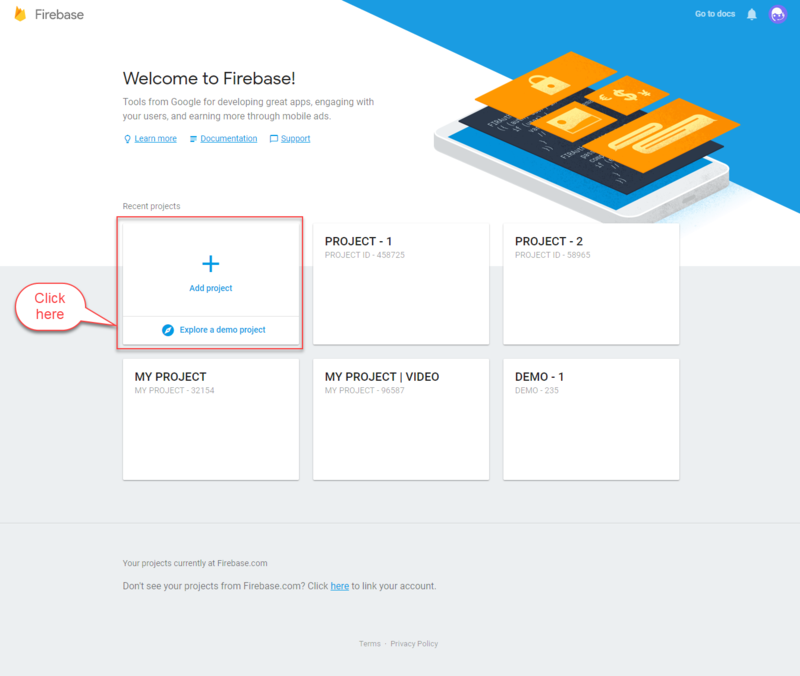 After opening Firebase page, please click CREATE NEW PROJECT button as shown in the above screenshot. 2. A small pop-up window will appear with the name of Create a project, here you have to enter your Project Name and then select your Country/Region. 3. After completing the details click CREATE PROJECT button. 4. After creating your new project click Settings menu icon and select Project Settings option. Please view below screenshot. A new Settings page will be opened. 5. After entering the Settings page, click CLOUD MESSAGING tab, here you will find your Project Credentials, copy and save your Sender ID and Server Key as displayed below. These credentials will be used in the next step of Magento2 configuration. After successfully installing this module please log in to the admin account and go to STORES menu and then select Configuration option as shown below. Configuration page will be opened, navigate to Webkul > MP Push Notification option. From here the admin has to enter the Firebase project credentials. Enter the Server key and Sender Id as shown in below screenshot. Click Save Config button to apply changes. Title – This will be the title of your notification message. Message – This is where you have to enter the content of your message. Redirect URL – When the user clicks the notification message it will redirect to new web page link. Tags – Add tags to your messages to identify them. Logo – You can upload any supported image file for the notification logo. To delete notification template(s) navigate to Marketplace Management > Push Notification Manager> Notification Templates. After that select the particular template(s) using the checkbox option. Then go to Actions drop-down menu and click Delete. A confirmation message will appear, click OK.
To send a new web push notification message, navigate to Marketplace Management > Marketplace Push Notification > Send Notification. After opening Notification Subscribers page, select any registered users using the checkbox or to select all users click the top checkbox near Id column. Then go to Actions drop-down menu, click Send Notification and select any one template. A final confirmation message will appear, click OK button. 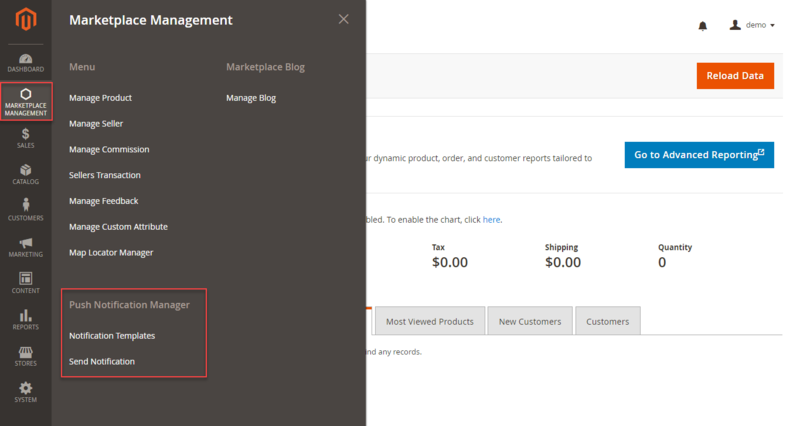 To delete any of the registered user(s), navigate to Marketplace Management > Marketplace Push Notification > Send Notification. After opening Notification Subscribers page select registered users using the checkbox or to select all the users click the top checkbox near Id column. Then go to Actions drop-down menu and click Delete option. Logo – The seller can upload any supported image file for the logo. To delete template message(s) navigate to Notification Templates and select your desired template(s) using checkbox. After selecting click Delete Template button at the top or click delete icon under Action column. A final confirmation message will appear on screen, click OK button. Here’s the sample web push notification message which will appear on the front-end. Please note: – If a seller or the admin select all the users and sends a web push notification message, that message will be seen by all the registered users of the website.